The day after Thanksgiving is the perfect time to spread peace, love and unity in the form of a Fortunate Youth concert. Hell, the whole point of Thanksgiving is to feel fortunate and reflect on your life blessings! 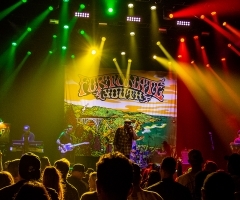 A traditional stop on the annual Fortunate Youth fall tour is San Diego on Black Friday, this time at The Observatory Theater in North Park. The 2019 West In Peace Tour had already hit several cities in NorCal and had just touched down in LA the day before Thanksgiving, giving the ever-touring FY boys a break for the holiday. 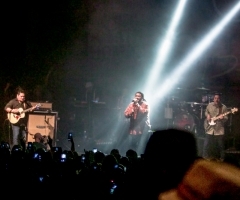 Back in action, what seemed like the entire reggae-rock community of San Diego packed the perimeter of the Observatory the night of November 23rd, waiting patiently to get inside the sold-out show. Walking towards the venue, not even at the doors yet, I passed Kurt of HIRIE, FY lead singer Dan Kelly, local San Diego alt radio station 94.9's prime reggae deejay Carlos Culture and SoCal Street Scene founder turned Tribal Seeds manager Kara Lyn. Clearly, the A-list was in the building. 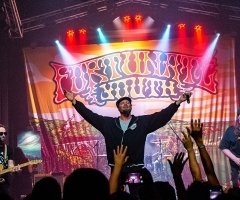 Thanksgiving is the perfect time to spread peace, love and unity in the form of a Fortunate Youth concert. Through the doors, Josh Heinrichs and Skillinjah were onstage performing an acoustic set alongside Dread Kennedy and Pat the Cat. The vibe was mellow, welcoming, yet energetic. Heinrichs invited attendees to visit him at the merch booth immediately following his set; I love when artists engage with their fans like that. Now, here is where the night gets interesting (like it wasn't already): east coast reggae-rock band The Movement was scheduled as direct support that evening, as they were for the entire West In Peace Tour. As it turned out, at least according to the rumors circling that night, Movement lead singer Josh Swain ended up needing emergency medical attention and thus, couldn't perform. Local San Diego reggae-rock band Through The Roots volunteered to take the slot LAST MINUTE ON A HOLIDAY WEEKEND. Their availability at a drop of a hat to help out reggae homies in need is beyond admirable. Cheers to the Through The Roots boys – way to step up! Through The Roots rocked the house with their signature flashing lights and kept the party going. It didn't seem like any time went by at all before it was headliner time. Fortunate Youth entered the stage to echoing applause, launching into their well-known fan favorites instantly. Of course, what would an FY show be without a copious amount of weed? The smoke inside the venue escalated into a thick fog once the band began their infamous "Burn One" track, known for the gracious torpedo-sized herbal donations of the We Should Smoke Movement. Too bad the venue didn't allow the band to "pass it around"... Maybe next time, San Diego. 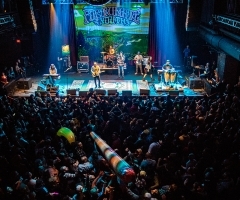 The Fortunate Youth boys just concluded their West In Peace Tour in Vegas at the Brooklyn Bowl, but make sure to keep your eyes peeled for winter tour dates, sure to be coming soon.